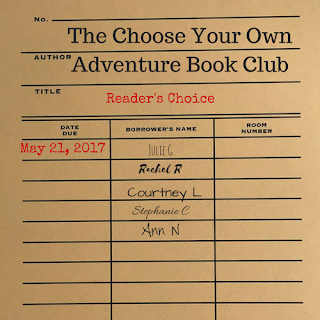 Now that I'm back on the blog, I'm happy to be bringing back my posts about who read what each month for the Choose Your Own Adventure Book Club. As a refresher, since it's been a very long while, CYOA reads by theme rather than by book. We came up with a list of themes, tossed them in a Tardis cookie jar, and each month we draw out a new theme. Everyone chooses any book they want to read based as loosely as they want around that theme and then we get together and discuss what we chose and if we liked it the next month. It means that there's no pressure to read a specific book that you may or may not be in the mood for. It never feels like homework and we always come away with a full TBR after hearing what everyone else chose for the theme. Stephanie read A Court of Wings and Ruin by Sarah J. Maas and she can't stop talking about it. It's a definite rave from her and others in the group have also been enjoying the series. It's one I hear about all over the place, but I'm waiting because of my "series has to be finished rule". 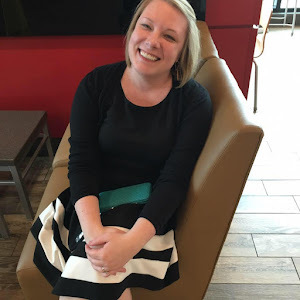 Rachel read Thick as Thieves by Megan Whalen Turner (squeee!). We've both been waiting for this one for ages. The group is divided on the series - some of us love it and others don't. Rachel and I are firmly in the "devoted to Eugenides" camp and she highly recommends Turner's latest addition to the series. I can't wait to get my hands on a copy! Courtney is in the midst of Big Magic by Elizabeth Gilbert. Her raves about it have led me to bump it up my TBR list. I'm reaching back for my creativity, which was misplaced somewhere in the last year or two, and now that I'm starting to find it again, I think this book could be a great jumpstart. Courtney definitely agrees. Ann read The Handmaid's Tale by Margaret Atwood in anticipation of the upcoming adaptation on Hulu. Her mention of it immediately made me realize that I have no idea which shelf my copy is on and also that I need to read it immediately. A search is underway. She loved it and said, like I've heard from many other sources, that it's timely and beautiful, and worth reading. As soon as I find my copy I'll be reading it as well. As for me, I'm currently listening to The Fireman by Joe Hill on audio and loving it. The narrator is excellent. I've got a road trip planned for this weekend and hope to knock out a significant portion of it because it is quite a long one, but once you start it's hard to turn it off. The last new adjustment to CYOA is that we decided to start trying on a food theme each month. This month we did ice cream sundaes. I had the ice cream and everyone else brought toppings. We wrote down a whole list of other ideas and we're going to try making it a food and book club since we had so much fun with the sundaes! 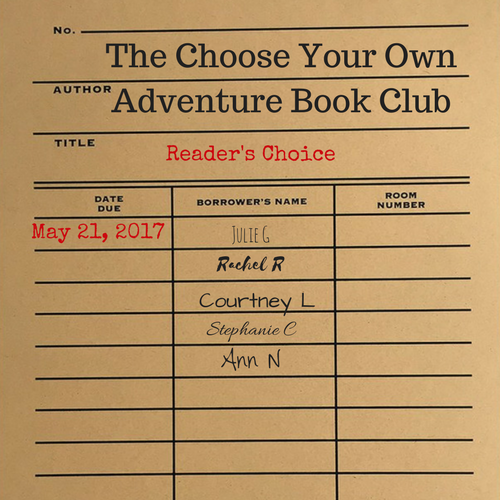 How about you, Reader Friends? Are you currently reading anything spectacular?